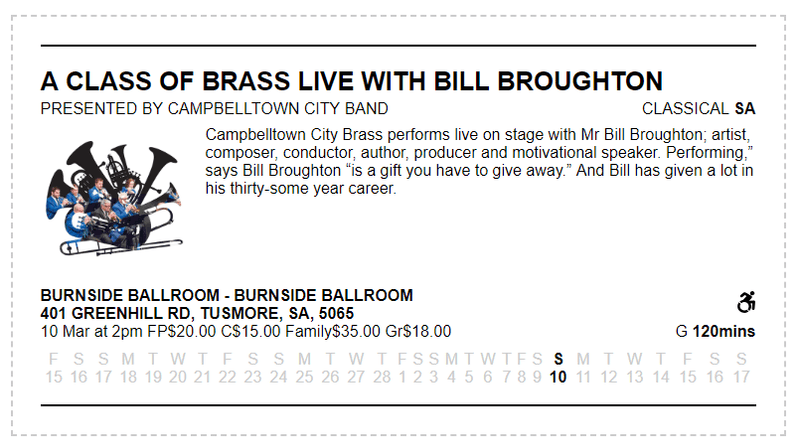 Campbelltown City Brass performs live on stage with Mr Bill Broughton; artist, composer, conductor, author, producer and motivational speaker. Performing,” says Bill Broughton “is a gift you have to give away.” And Bill has given a lot in his thirty-some year career not only as a virtuoso trombonist, but as a composer, conductor, writer and producer as well. Bill Broughton began his career as a studio musician in 1968 and soon was playing trombone for television and motion picture studios in Hollywood. Bill moved easily into the next phase of his career. Composing for shows like “Quincy, M.E.,” “Hawaii 5-0,” “BJ and the Bear,” “The Tonight Show,” and many others, he soon accumulated an impressive resume of nearly 100 musical scores for television. Bill also has several Symphonic and other commissioned compositions premiered as well. “Some people can really teach, some can really play, others have vast experience and knowledge of music – In Bill Broughton you get it all, and then some. Bill is that rare commodity, the complete musician. No matter if it’s classics, pop or jazz, Bill is at home – and much more than that, he’s able to pass on his love of the music and inspire those around him” – James Morrison, World renowned Musician & Aussie Icon.